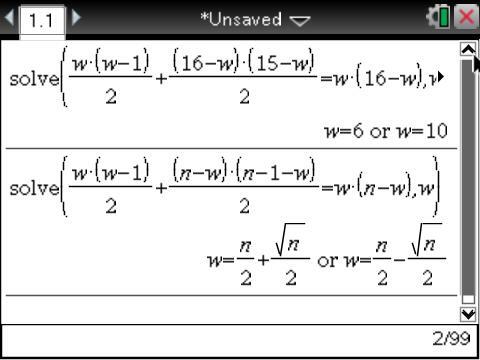 A solution appears on the page, but it doesn’t suggest how it was determined or if the solution is unique. I’ll provide that below plus an extension. This is a quadratic equation with solutions , verifying Futility Closet’s solution, and establishing those solutions as the only ones possible. Extension: For what total number(s) of white and black billiard balls is the likelihood for two drawn balls to be one of color the same as them being one of each? I solved this with my CAS (below) to get . I noticed two things from this solution. Because w must be a whole number, the denominators require n to be an even number and to guarantee that, the square root means n must be 4 times any perfect square. For any value of n, there are only two solutions for any of these situations, a point that could have been obvious before seeing the solution if you noticed the equation was quadratic, but something I suspect many (most?) students would initially miss. The original problem gave with solutions confirming the patterns predicted by the general solution. For another possible solution, let with solutions . A further extension of the general solution would be to show that as , the likelihoods become essentially equivalent for drawing either two different colors or both the same color. Pedagogical side note: Both equations in this problem are quadratic and could be solved “by hand”. But, why? The point of these questions focuses on probability and not symbolic manipulation, so I argue that use of a CAS is entirely appropriate and perhaps should be the ideal approach in this problem. Keep the focus appropriately on the problem. If a teacher needs to assess a student’s ability to solve quadratic equations, that should be done in a different question, not here.